Another early start (as were they all) had us heading north from Laredo up I35 then off onto highway 83 towards Carrizo Springs. Our first stop was a colony of Cave and Cliff Swallows flying around under a roadbridge. There were quite a lot of corpses on the ground under the bridge but no obvious cause of death was seen. 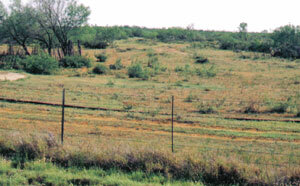 Next stop was an area of scrub and bushes stretching away into the distance. I don't believe we intended to stop but the second van did when they found a male Lark Bunting. We (the leading van) then stopped and disembarked to get a view of the bird. Our viewing angle wasn't good but eventually we all saw the bird between two fence posts. It was a first-year male and not a tidy black adult male. As we watched this bird I heard a singing male Cassin's Sparrow and from the other side of the road came the scratchy song of Bell's Vireo. We could also hear Olive Sparrow singing here. Strung out in a line along the roadside was scanned the bushes and found Curve-billed Thrasher, more Cassin's Sparrows, showing very well, and a quite close Grasshopper Sparrow. A highlight for pretty well everyone (my favourite was the close Cassin's!) was a somewhat distant but still clear male Painted Bunting – a strange-looking mass of colour against a grey sky. Also here we had Ash-throated Flycatcher, Cactus Wren and Golden-fronted Woodpecker. Carrying along the highway we were picking up Chihuahuan Ravens, Harris's Hawks and Pyrrhuloxias on the telegraph wires and poles. We stopped whenever something good was spotted. This way we came across Eastern Meadowlark, Couch's Kingbird, Northern Cardinal, two male Bullock's Orioles, an out-of-accepted-range male Audubon's Oriole, two Greater Roadrunners and a male Blue Grosbeak. Although there was no water visible we also had a Green Heron fly across the road. At one point someone asked Vaughan if one can get gamebirds here. This resulted in slamming on the brakes and urgent questioning, followed by quick reversing after which we all watched a couple of close Scaled Quail – one of our mythical birds that we missed in Arizona and a bird which has become very hard to find this far east in Texas. We were aiming for a high point in the road where there is a water tank for cattle to drink from. Here the land was a bit more open. The right hand photo above shows a pile of cut sticks. Feeding in this were three female and a male Lark Bunting. Further in I saw a flock of at least 30 Lark Sparrows briefly fly up and a White-crowned Sparrow. We all managed to see at least three Clay-colored Sparrows and two Red-tailed Hawks. 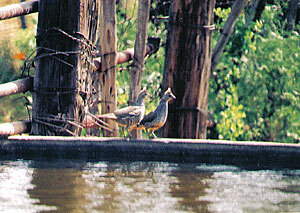 Crossing the road to where the water tank was we came across another pair of Scaled Quail coming to drink the water. A scan around yielded yet another male Audubon's Oriole, seeming to indicate a range expansion in this area. We walked down a sandy path getting a Black-throated Sparrow and again hearing Cassin's Sparrow. A sudden shout saw us all freeze as a swarm of bees came close past! Both Ash-throated and Vermilion Flycatchers were seen as was a lone Swainson's Hawk on a large radio mast. Heading onto Carrizo Springs we got more of the usual roadside birds – Harris's Hawks (nesting on telegraph poles), Chihuahuan Ravens, Scissor-tailed Flycatchers and an out-of-range Northern Caracara. At a garage in Carrizo Springs we found a male Brewer's Blackbird on the forecourt, a pair of displaying Scissor-tails, and I spotted a kingbird on a wire. Most people had gone off shopping but I wanted to see the outer tail feathers of this bird because it looked wrong for Couch's. Sure enough, white outer tails were present and so we had to hunt down the others to tell them of the Western Kingbird on the wire. At a brief stop by a roadside rest area we had five more Lark Buntings, an Ash-throated Flycatcher and 30+ Cliff Swallows collecting mud for their nests.